← Final Post on Hutchmoot 2012 — Conquer Depression! Rope Bridges, Hippos, and Crocs, Oh My! My back is acting up thanks to the trip to Nashville for Hutchmoot 2012 and having to sleep in two different beds from my own. So, my doctor put me on a 12 day steroid dose pack because I am traveling. Again. One week of work in my “day job” as a radiologist and then I was off this past Saturday to work with my co-author, Mark Sutton, on an upcoming update to our depression book. But, the steroids may make my back better, but they keep me wide awake every night! I don’t mean restless and cat napping. Wide awake! The entire night! So, I’m sitting here in my hotel room in Orlando at midnight wondering when the Tylenol PM is going to kick in! So, I thought I would share a profound event from my day. I decided that on Wednesday morning, since Mark would be prepping for a class to teach tonight and would be unavailable for writing that I would do something fun. Just for me. I had seen the ads on the internet for months so I took a chance and, yes, they had an opening on Walt Disney World’s Wild Africa Trek. This is a three hour tour behind the scenes on the Kilimanjaro Safaris at Disney Animal Kingdom. It involves a great deal of walking through narrow trails in the wooded areas around the animal’s homes. And, it involved climbing, leaning over a cliff or two, and crossing creaky rope bridges. I was thrilled! After all, what is a bad back compared to almost getting eaten by crocodiles. I showed up at 1015 after taking care of bathroom duties (No restroom for 2 hours) and was zipped and tied into a harness by Devin and Eleanor (later switching to Elly as we got to know her!). Now, here is how it works. We follow our guides through winding, narrow trails in the jungle areas to a “cliff” overlooking animals. We’re clipped into a tether so we can “lean” out over the cliff to the animals below. I must admit, even though the hippos are herbivores, watching the two hippos chomp down on cucumbers, melon, and bananas thrown to them by our guides gave me the heebie jeebies. Those molars and tusks looked rather dangerous. I guess the highlight of that little venture was when “Nacho” marked his territory with a “dung shower”. Yeah, it is what it is. Next we arrived at the crocodile enclosure. Here, we had to cross two rope bridges complete with broken boards and holes in the side. Not to worry. We’re tethered in! 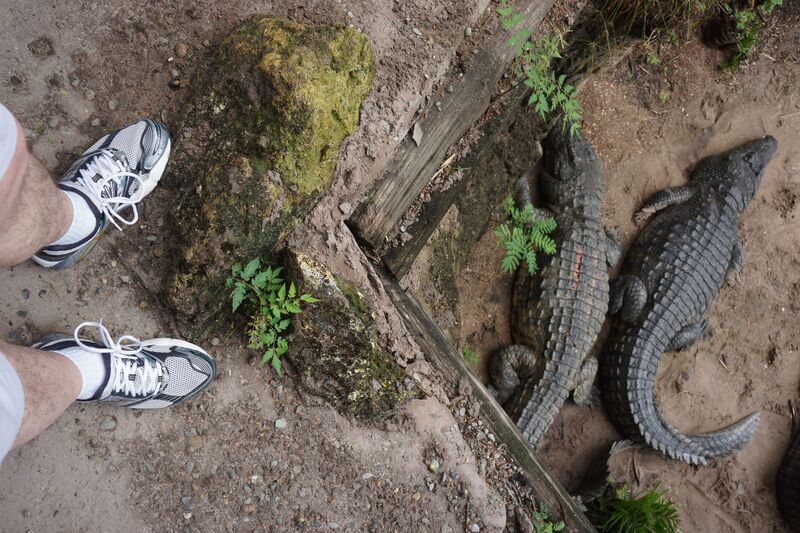 But, I still felt a little creeped out as I passed over the 23 or so crocs napping just 15 feet below. Then, we were tethered on the “cliff” and just six feet below my leaning body was a huge croc as big as a banana boat! Not to worry! They only eat once a week. But, I was informed that if I fell in, they would bite me, kill me, and then hide my body for a snack later on! After this perilous but thrilling part of the journey, we were loaded onto our own small open bed truck to drive around the savannah. We stopped and had ample opportunities to take pictures of giraffes, wildebeest, antelope, elephants, ostriches, rhinos, cheetahs, lions, and warthogs. 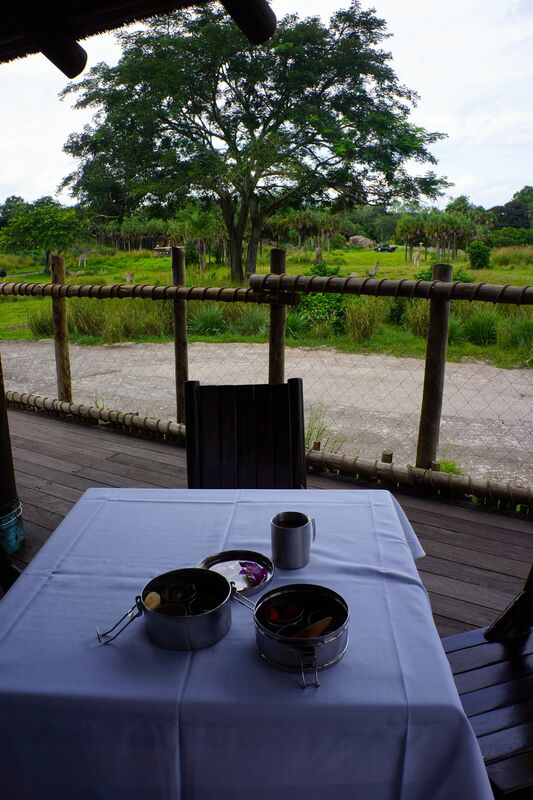 The highlight of the day was arriving at our own private pavilion overlooking the entire savannah while we had lunch. It was so refreshing to sit down in a cool breeze and look out over the animals in the savannah. 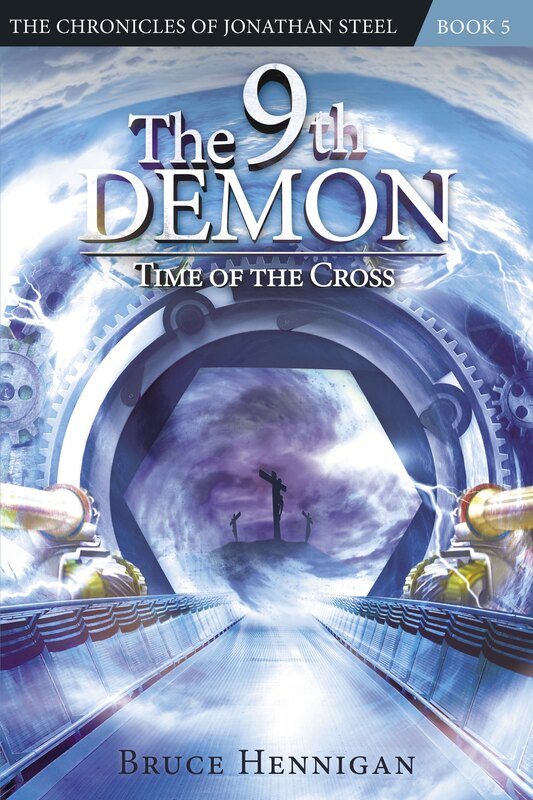 A great and wonderful adventure that I would highly recommend to anyone. But, no journey is without its lessons. So, I want to share some of what I learned from this adventure. Dung Showers — No matter how hard we try in life, there are times when we end up producing a “dung shower”. Nacho, the hippo expelled large quantities of his “refuse” and then would twirl his little tail around like a propeller slinging it in a wide arc to mark his territory. 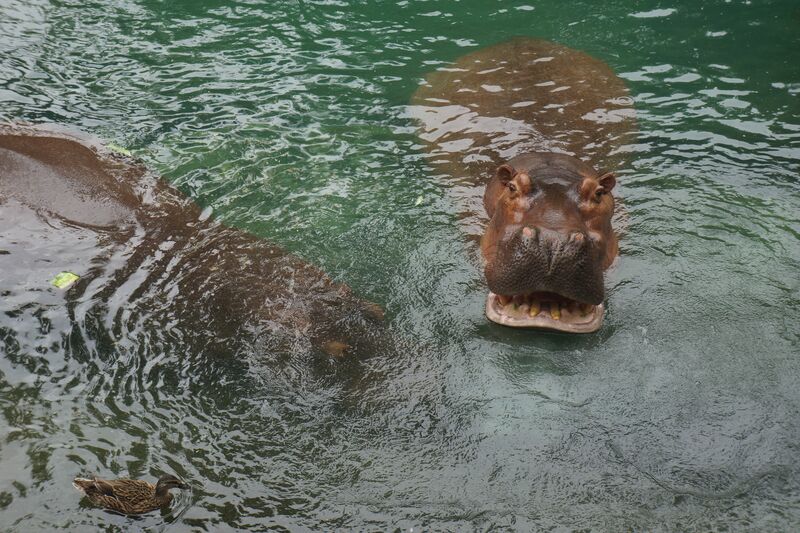 Whenever another male hippos would show up, they knew Nacho had been here! We mark our territories whether we intend to or not. Or words and actions have consequences and in a world where Christianity is increasingly condemned and looked down upon, it is up to us to find better ways to “mark our territories”. Perhaps with something other than dung? Like, love, understanding, compassion, mercy, empathy, kindness, and so on. So, tomorrow, don’t hit anyone else with a “dung shower”. Instead, shower them with kindness. It’s a much better mark to leave behind! 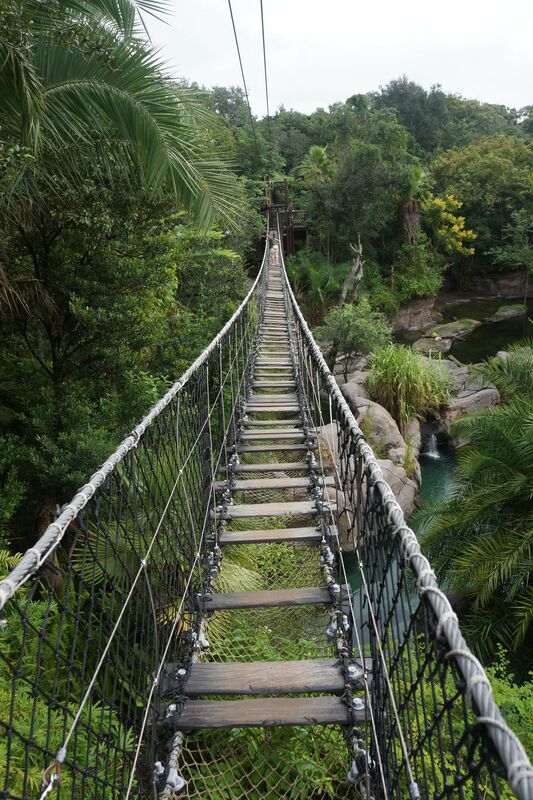 Rope Bridges Sway — There is definitely a difference between solid ground and a swaying rope bridge. I found out the hard way that if you lean over the side to take a picture of a crocodile the other side of the bridge will move AWAY from you! In fact, you sway DOWN toward the croc! This throws you off balance and you are teetering on the brink of a crocodile snack. But, solid ground doesn’t shift under your feet. Walking through the jungle up and down slopes, roots in the soil gave me enough traction to keep from slipping. There are no roots on a rope bridge. In fact, our roots do more than nourish us. They steady us. They give us purchase on the shifting ground around us. Our culture is filled with lies. “What is the lie?” is the question I ask myself often when I am feeling down, depressed, or stressed out. Like the rope bridge, when we lean into the lie, we teeter on the edge of disaster. Instead, we need to rely on our rooted, solid stance on solid ground. All else is shifting sand, as the song says. In today’s postmodern culture, we tend to compartmentalize the world and think that all is NOT related. But it is. We cannot walk on a swaying rope bridge and act like we’re on solid ground. The TRUTH is there is only one way. One solid ground. Don’t buy into Satan’s lies and his swaying rope bridges. Instead, rely on the solid ground in which we are rooted in Christ; the Way, the Truth, and the Life. Standing on the Brink — I have a picture of my feet at the edge of the cliff that dropped directly down to a sleeping crocodile. He was only about six feet below me. The only way I could get the picture was to lean forward. My harness was attached to a bungie like rope behind me so I could feel the elastic pulling me back away from the cliff. But, I really wanted to get that picture. Suddenly, I lurched forward and for an almost infinite moment, I was falling to my death. I picture over two dozen crocodiles waking up and tearing away bits and pieces of me to hide away in their little pond for a midnight snack. And, there is a lot of me to go around. Turns out, Devin had tapped me on the shoulder to get me to turn around so he could take a picture of me with the crocs in the background. As far as he was concerned, I was never in danger. But, my imagination took that little lurch and pushed me straight into one of those old Johnny Weissmuller Tarzan movies where the bad guys feed the crocs. Lesson learned: God has us on a tether. We have a path to walk that is straight and narrow. But, true to our nature, we like to wander to the edge of that path to check out that exotic odor, or that enticing flower, or that alluring seduction. And, when we reach the edge of the cliff, we have this false sense of security that we are still within God’s will. We feel the tug of the tether and yet, we lean further and further over the pit. There, waiting below, disguised in his lies is Satan. He has his mouth open, his eyes gleaming, just waiting to tear us apart! And then, God taps us on the shoulder. He awakens us from our trance and we lurch with the unexpected realization that we had almost gotten taken in by Satan again. Again! When will ever learn? Be mindful of the tether. It is there for a reason; a connection to God through His Holy Spirit who holds us back from oblivion because God loves us. Thank you God for a tap on the shoulder. Posted on October 3, 2012, in Breaking News, My Writing, Steel Chronicles and tagged anger, Crocodiles, Depression, Dung Shower, Hippos, Hutchmoot, Lies, Rope Bridges, Satan, Solid Ground, Wild Africa Trek. Bookmark the permalink. Leave a comment.